It doesn’t take much for me to have a rave about the Pureology haircare and styling range, mainly because it’s so damn great as well as being good for you and the planet. Their high performance products are quite simply amongst the best on the market for those that like their beauty with a conscience. Jim Markham created the Pureology haircare line in Irvine, California in 2001. The very clever chap revolutionized colour care and gave it a moral compass, launching the first 100 per cent Vegan formulas and ZeroSulfate shampoos for colour-treated hair to an eager audience of consumers much like myself. Jim identified a need among professional colourists and their clients for gentle, naturally based products that deliver superior performance and keep your colour looking great for longer, and today, Pureology is the number one colour care brand in the USA. And as an added bonus, the company are committed to delivering superior hair colour care through the most indulgent products and services, while preserving and promoting environmental sustainability. The core values of Jim and his team have led the company to become one of the first prestigious haircare brands that embraces and pioneers sustainability. “We continuously strive to achieve the most decadent experience while preserving our environment with sustainable practices,” they say, which is about as eco luxe as it gets! They have several systems on offer depending on your hair type, the latest release being for those in pursuit of lightweight, bouncy volume i.e. probably most people I know! Called the Clean Volume range, it has been formulated to give fine, colour-treated hair exactly what it needs – light, airy fullness, flexible movement and shine. Entirely free of sulfates and parabens like all of Pureology’s offerings, Clean Volume is infused with super charged natural ingredients to help boost volume when and where it’s needed. Aloe water helps hair retain moisture, provides body and absorbs oil, while soy protein fortifies the hair adding lustre and protecting against environmental aggressors. Instead of the commonly used silicones that can feel heavy on fine hair, Clean Volume instead uses sunflower seed oil and Brassicacae plant extract to condition, enhance manageability and shine, smooth the hair’s cuticle and reduce frizz. Clean Volume Shampoo (RRP$41.00): a concentrated, volumising, ZeroSulfate® formula thatgently cleanses fine hair without stripping colour. Provides light, airy fullness. Clean Volume Conditioner (RRP$44.00): a daily volumising conditioner that detangles and infuses hair with lightweight volume and shine. Clean Volume Instant Levitation Mist (RRP$44.00): the same great formula as Pure Volume Instant Levitation Mist, this menthol-infused formula elevates the hair with 24 hours of magnificent volume and provides exceptional root lift. Clean Volume Weightless Mousse (RRP$44.00): a conditioning mousse that provides all-over weightless volume and leaves hair soft and shiny. I have been using the shampoo, conditioner and mousse since I was lucky enough to be sent a set, and can’t rave enough. My hair isn’t as oily as it is during summer time at the moment, but it can do with all of the added volume it can get – and this definitely delivers. Another win for Pureology – yes! 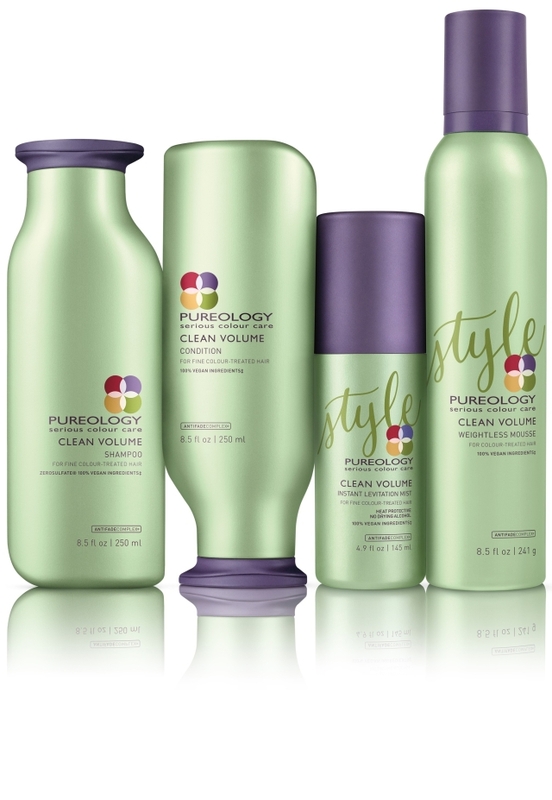 Pureology’s Clean Volume range is available right at all Pureology salons and stockists – and comes highly recommended.